Galearis spectabilis (L. ) Raf. 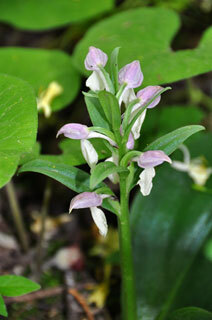 Also Called: Showy orchid, purple-headed orchid. Stems: Flowering stem erect, glabrous. Leaves: Basal, 1-3 (usually 2), nearly opposite, broadly elliptic to oblanceolate or narrowly egg-shaped, 3.5 to 8 inches long, .8 to 4 inches wide, dark green, somewhat succulent, glabrous; tip rounded or pointed; base gradually narrowed to sheathing stalk. Inflorescences: Raceme, loosely 2-15-flowered, around 3.5 inch long, terminal; flowers subtended by leaf-like, lanceolate or elliptic bracts, .6 to 3 inches long, .2 to 1+ inch wide; lower bracts much exceeding flowers; upper bracts equal to or shorter than flowers. Flowers: Showy, erect; sepals 3, elliptic to lanceolate, 2/5 to 3/4 inch long, 1/5 to 1/4 inch wide, pink, lavender or purplish (rarely white); lateral sepals curve up and overlap upper sepal to form a hood; petals 3, linear, 1/2 to 3/5 inch long, 1/12 to 1/6 inch wide; lower petal (lip) larger, rhombic to lance-ovate, 2/5 to 3/4 inch long, 1/4 to 3/5 inch wide, white, protruding downward; margin wavy; lateral petals pink, lavender, or purplish, arching over sepals; forming hood over column (structure formed from stamen and stigma). Fruits: Capsule, erect, ellipsoid, 1/2 to 1 inch long, 1/5 to 1/6 inch wide, somewhat triangular in cross section, strongly ribbed; seeds numerous, tiny. Habitat: Moist, calcareous woods in rich soil. Distribution: North half of east fifth of Kansas. Comments: Galearis from Latin galea "helmet", alluding to the arching sepals and petals and spectabilis "showy" or "remarkable". The flowers are pollinated primarily by bumblebees.